Carl Krause’s new book “Deadly Mix: The Beginning” is an engrossing detective novel mixed with elements of police procedural. 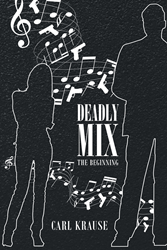 Recent release “Deadly Mix: The Beginning” from Page Publishing author Carl Krause is a compelling narrative about a private investigator and his fiancé as they brave menacing world of murder and intrigue. Carl Krause, a USMC Vet who has been twice around the world, has completed his new book “Deadly Mix: The Beginning”: an exciting story about a veteran private investigator Nicholas Kane and his naïve but genius fiancé Madeline, as they face struggles related to their involvement in police and investigation works. Published by New York City-based Page Publishing, Carl Krause’s exhilarating book features a stirring tale filled with an exciting narrative following the journey of a proficient detective and his beloved. This book is aimed at readers who enjoy detective novels and related works of literature. Readers who wish to experience this thrilling page-turner can purchase“Deadly Mix: The Beginning” at bookstores everywhere, or online at the Apple iTunes store, Amazon, Google Play, Kobo, or Barnes and Noble.